Melbourne Rebels crashed back to earth in brutal fashion with a shock 32-7 Super Rugby loss to Western Force in Perth on Saturday night. The Rebels were irresistible in their 35-14 demolition of the Cheetahs the previous week, while the Force looked set for a long season after being thumped by New South Wales Waratahs and the Brumbies in their opening two games, but the Perth franchise turned things around in dramatic style - scoring four tries in the opening 27 minutes on the way to the bonus-point victory in front of 9895 fans, and holding the Rebels scoreless until substitute Telusa Veainu scored a belated try after the full-time siren. The win lifted the Force off the bottom of the table, and snapped their four-game losing streak against the Rebels. 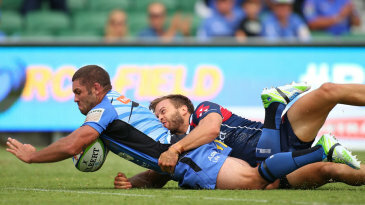 Skipper Matt Hodgson scored a try in his 100th match for the Force, while flanker Angus Cottrell, former Queensland Reds winger Luke Morahan and scrum-half Alby Mathewson also scored. Force skipper Hodgson praised the team's hot start, saying "I think that's the best 30 minutes we've played at the club ... to come out and play like that ... is something I'll never forget" while coach Michael Foley said the win was good reward for the team's hard work. "That's a nice performance to have early in the season," Foley sad. "It's been a long time since there's been a bonus point here for us. I think the way they responded to some of the criticism this week was very good." Rebels coach Tony McGahan said the result represented "a big learning curve for all of us" after making six changes to his starting side for the fixture, a decision that backfired badly as the Force took control from the outset. "We're all responsible for the result. "I thought the Force were terrific tonight. They really played for each other. They brought a real intensity, a real emotional attachment to each other, and they deserved the result." The Force led 32-0 at half-time, with scrum-half Mathewson key to the early onslaught as the hosts beat the Rebels in nearly every aspect of the game and enjoyed 75% possession in the opening 30 minutes. Mathewson started the riot in the second minute when he sold a dummy to Rebels lock Caderyn Neville before strolling over. Hodgson's bravery then set up the second try, with the former Wallabies back-rower launching himself at a high ball to open the door for Morahan to cross. And the inspirational skipper had a try for himself in the 24th minute when he pounced on a lucky bounce. The four-try bonus point was in the bag by the 27th minute after Rebels fly-half Angus Roberts dropped a high ball, allowing Cottrell to cross a few phases later. McGahan had seen enough by that point, dragging prop Max Lahiff and lock Neville from the field in a desperate bid to spark his side. Fly-half Bryce Hegarty was also thrown into the fray at half-time, and the changes paid dividends as the Rebels stemmed the flow. But it was too little too late as the Force cruised to their first win of the year to celebrate Hodgson's milestone in grand style.